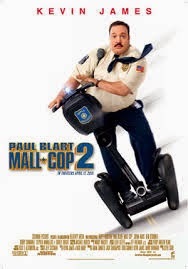 New Jersey security officer Paul Blart is awkward and insecure, but good-hearted and brave. Lately, though, he is feeling alone. The three most people in his life have been his wife Amy, his young adult daughter, Maya, and his mother. However, Amy divorced Paul after less than a week of marriage, and Paul’s mother was recently killed when she was struck by a truck. 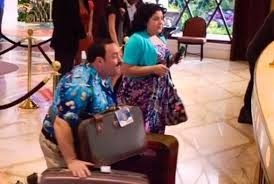 Paul now clings to his daughter, and believes that he will be OK as long as she is by his side; however she has just been accepted to a university in California. Paul and Maya take a trip to Las Vegas for a security event, while Maya decides whether to tell her father about her acceptance to UCLA. While there, Maya falls into the hands of criminals, and Paul must summon his security skills – and his fellow security officers – to save her. There aren’t any definite adoption connections in the film. 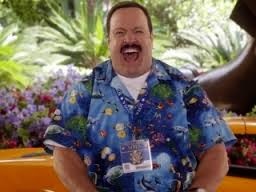 Some things that might apply to parenting in general: Paul Blart and Maya appear to constitute a multi-cultural family. Paul struggles to come to terms with the fact that the daughter he’s protected for so long is now an independent adult; he struggles with letting her go (see Pacific Rim for a similardynamic). Maya feels responsible to meet her father’s emotional needs. I saw a similar theme in the recent Annie remake, where Quvenzhane Wallis’ titular character seemed to be responsible for teaching her foster father about love and nurturing. Paul and Maya do obviously love each other. They each try to put the other’s needs ahead of their own. Their struggle isn’t about one person needing to become less selfish; it’s about two unselfish people learning how to let their needs coexist, and that’s a task that’s common to many families. Paul’s mother is run over by a truck, on screen, about a minute into the movie. It’s unexpected, and the camera does show it. Because of the unexpected aspect, the fact that the death is shown on screen, and the way it’s presented, this could be a very traumatic scene for viewers who have lost a parent either through death or familial separation. There’s actually a second on-screen incident of a car striking a pedestrian. Critics have pretty roundly hated this one – it’s currently got a 2% Fresh Rating on Rotten Tomatoes. It is good for some pretty mindless laughs, and there is an endearing element to the father-daughter relationship that Paul and Maya share. I worry that the scene where Paul’s mother is killed will be too shocking for most young viewers who have lost a parent. The film’s probably OK for some older teens, and I do particularly like the way they try to meet each other’s needs (see Strong Points, above). I think this one could be used by skillful parents to have worthwhile conversations about parent-teen relationships, even though the film itself isn't particularly reflective. Other films might be better choices, though. Check out Pacific Rim, Annie, or for films featuring a strong, single adoptive dad, check out Martian Child or Despicable Me 2. How can people who love each other (like parents and teens) deal with it when they disagree about important things? Does a parent’s job change at different points in the lives of their children? When, and how? Have you ever gotten advice from a parent that seemed silly at first, but later turned out to be helpful?